2. Con Suerte, Mi Amigo! My May trip to the East Cape of Baja was an interesting one. I had approached the trip with some trepidation, as a tackle shop owner friend of mine returned from the area the week prior to my trip frustrated by the poor bite. On the other hand, the pictures posted on the website of my destination showed an increase in the number and size of fish caught, most noticeably in yellow fin tuna. 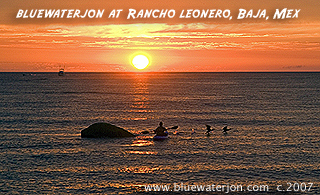 I had arranged for panga support with a panguero named Guillermo for two out of the four days that I would be fishing. Fishing in the East Cape is tricky. If the dorado are close to shore, my preference is to simply launch from shore by myself with a bunch of jumbo squid that I bring down. They often seem to find me about a mile out and south a bit, and I enjoy their runs and acrobatics. I arrange in advance for panga support because I never know where the fish will be, and if they are not within paddling reach, I want to get dropped off where they are. For some reason, the dorado were not yet present in significant numbers. I tried the first afternoon that I arrived there to attract some, but found none, and resigned myself to the conclusion that indeed the dorado were not going to be the species to target this trip. The next day, I left with Guillermo. He is a kind, soft spoken fellow. Every time I run an idea by him, as in, “Do you think we’d run into some tuna over there?” he says calmly with a twinkle in his eyes and a shrug of his shoulders, “Con suerte, mi amigo.....” , a gentle reminder of the fact that no matter how hard one works at scheduling a trip at the right phase of the lunar cycle, properly presenting bait or lure, using the right tackle, and so forth, it all hinges on a factor that is out of our control. I guess that’s why fishing is so exciting! We went to the lighthouse in search of roosters. He dropped me off and I trolled two rods. On the way to the lighthouse I whittled off a large portion of the grips on my new rods, one with a sardine, and another with a caballero, which is similar in size to a 6 inch greenback. Circle or regular hook? Ringed or palomar knot? Swivel with fluorocarbon leader or straight onto the line? One can spend a lot of time preoccupied with these questions, only to have a needlefish ruin the last three feet of your line and take your hook right after you let your baits out. Needlefish are certainly the most annoying fish down there. They look like something from the Paleolithic age. The first 5 seconds of their run can fool one into thinking that a fish of significance is on, but once you reel them in, you invariably have to retie your terminal tackle, as their sharp beak wreaks havoc on your setup. They jump and gnash their sharp teeth furiously as you sit there wondering if it’s possible to get your last special hook out of their mouth without getting a nasty laceration. After trolling for a while, a pattern began to repeat itself. The roosters crashed on my bait and mouthed them, but never swallowed them, and after a full day of panga support, I had little to show for it. I even went out that afternoon solo, and had more of the same. Now what? I couldn’t figure out if it was worth it to rent another panga. That’s 250 a day plus bait and tip. For someone who prefers straight kayak fishing, spending all that money and having nothing to show for it can be a dreadful experience. I tend to think about how I could have possibly landed a nice pargo jigging a croc 50 yards off shore. On the other hand, if the fishing within paddling distance is poor, then you paddle like a madman all over the place, and watch your limited vacation time slowly disappear. Adding to this agony, you often see the people on the powerboats returning from their day’s jaunt and posing on the beach for pictures with their batch of 40# fish. 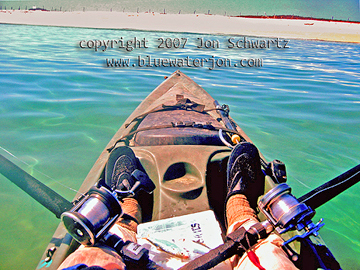 When I waddle up the steps soaking wet with no fish, and laden down with your paddle, two rods, PDF, fish finder, tackle box, thermos, and gaff, and the other guests ask you with a smirk how you did......it seems that you are confirming their ideas that you never had a chance of landing anything other than needles and triggerfish. If they only knew what we can do!! Perhaps unconsciously, I made the decision the next day by failing to secure a panga in time. When I saw Paco at 5:30 that morning, he told me that he couldn’t arrange a panga at such short notice, so I was left to my own devices. It turned out to be a blessing in disguise. Usually I use a Scrambler XT. This day, I decided to use John Ireland’s Scupper Pro. Compared to the tug boat XT’s, the Scupper Pro felt like a dart in the water. I paddled over to the men in the bait skiff. The cruisers were all vying for position to get the best bait. There was a tournament going on, and some of the boats were not getting any bait at all. Obviously the contestants were upset by that and a feeling of tension was in the air. As I paddled closer, I began to think that I might get left out. One of the men in the cruisers, half jokingly, screamed, “Get outta here! Sink that thing! !” The men in the bait skiff kindly waived me right in amongst the cruisers, so I paddled right and loaded up a Plano bait bucket with sardines. Well guess what? As soon as I plunked that thing in the water, the “dart” I was paddling felt like a slab of lead. I paddled just out of range of the cruisers, and pinned a lively bait on. There are often prize fish right there waiting for bait to fall. I planned to let it out more when I got farther away. BAMMM! I got hit as I was letting a bit of line out and almost got a bird’s nest. I was major bendo right in front of all these boats and as I tightened down the drag and got pulled towards the shore, I let out a holler. Needless to say, the guys in the boats who were still waiting for their bait couldn’t believe it. I felt as if it was a victory for the world’s kayak fishing community! It made some nice runs, so I figured it was a nice pargo. It turned out to be a big ladyfish, maybe 6-8#. I asked the fellows in the bait skiff if they wanted to eat it and they declined, so I released it and paddled south up the shoreline as fast as I could, hoping to beat the wind. After I made about 100 yards tugging that Plano, I realized that I had neglected to bring enough small hooks, as well as my new digital camera, so I called Paco on the VHF and he kindly agreed to send his son down with these items and meet me at the launch. It would cost me to do this because I would lose a lot of ground and the wind might come up when I started on my way back. Paddling with the Plano against the wind in a Scrambler is difficult; I imagine it’s like using a drift sock. Still I figured it was worth it, and sure enough, the wind started up once I picked up the gear. I had gotten quite a burn on my arms and legs the day before, since I only had SPF 22. In all my preparations for this trip, I had forgotten sunscreen, and all the desk had was the 22. In my tackle box were two rolls of protective finger tape, and I took a quick break from paddling to cover both forearms with this. 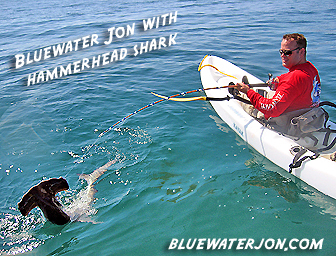 I intended to paddle up the beach, about 15 yards from the shore, keeping two baits within eyesight. I do this so that the needlefish leave the bait alone. Then when I see less needlefish, or I see the baitfish being chased, I feel more confident that I can let the baits out. One has to keep these things in mind, otherwise you will lose a lot of baits and hooks to the needles, and each time you stop to tie another on, you lose 25-40 yards with the wind blowing you back. I came to a place where I landed a pargo last year trolling a large mullet in much the same fashion, and let the baits out. There was a bit more structure underneath. I finally got what seemed like a good hit that lasted, so I let the fish run with it, tightened down, and I was on to something good. About 5 minutes later I landed a nice Jack Crevalle, or Toro, as they are called in Spanish for their fighting abilities. Not the knock down drag out battle that I had with a much larger one last year fishing with Rod, Val, and Jim, but still a nice one, and I was very pleased, and I let out a yell. Turns out two gringos who own houses right there were putzing around in an inflatable, and we chatted a bit. I mooched some sardines off of them, as many of mine hadn’t made the long journey in the Plano. With the new baits in tow, I pinned two more on, and saw sardines jumping, and within seconds, I was on again. 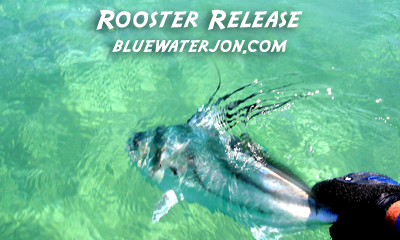 One of the best sights you can see are the telltale dorsal fins of a rooster as it struggles for freedom just under the surface with your bait. This one was just a baby though, and before I could snap a picture, he unhooked himself, which was just as well. A bit farther up the beach, I got slammed by another one, this one being of respectable size. I’d say 15# or a tad more, who knows. This time I stopped and took out my new camera. Many of the photos I took that first day came out with blurry spots on them, since my camera had condensation on it from me storing it in the hull right next to 3 large bags of frozen squid. At this point, the wind had picked up to a point that made paddling with the Plano a true grind, and since I felt satisfied, I turned back. The Plano worked in my favor on the return trip. The wind would have blown me back too quickly, and the Plano had the effect of slowing me down to the perfect trolling speed. Pinning two of the last remaining baits on, I enjoyed the pleasant, effortless drift. About half way back, something took a bait again, and a situation began to develop that I had experienced with a fish in a prior trip in almost the exact same spot. I was trolling only 15 yards from the beach, just outside of the range of the breaking waves that had been created by the wind only an hour or so before, and when the fish ran, he began to pull me right into where the waves could roll me. I thought that it would be hilarious to be beached by a fish, but at the same time, I had a lot of gear on top, and had no interest in such a landing, so I tightened down the drag, and luckily the fish changed direction and headed out to deeper water. After another fun fight, I released my third and final rooster, and let out a series of grateful hollers. Needless to say, I took more than a little pleasure sharing the photos with the power boaters later on in the bar, some of whom had not had a single bite after trolling 50 miles all day.